The Tennessee State Museum is pleased to announce that its exhibition, Remembering the World War I Doughboy: The History of Tennessee’s War Memorial, on view at the Military Branch Museum, has been extended until December 31, 2016, due to popular demand. The exhibit, originally slated to conclude on June 11, highlights the history behind the War Memorial Building which was built in 1925 as a result of Tennessee’s efforts to preserve the memory of those who fought and died in World War I. 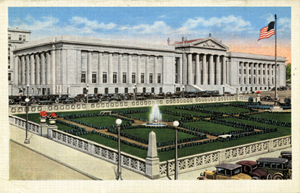 “We have been very pleased with the number of visitors who have come downtown to the museum’s Military Branch Museum to see this important historic exhibit, showcasing one of Tennessee’s greatest architectural treasures,” said Lois Riggins-Ezzell, executive director of the Tennessee State Museum. Dr. Lisa M. Budreau, the museum’s senior curator of military history, who researched and organized the exhibit, has led several important tours through the exhibition. “Tennessee’s role in World War I is one of national importance. The War Memorial Building pays homage to the sacrifices that were made during this tragic period of world history. WWI was often referred to as the ‘war to end all wars.’ In 1919, with soldiers returning from overseas, the memory of those who would never return was fresh in the minds of many Americans,” she explained. The Tennessee General Assembly called for “a lasting monument to honor heroes of the world war.” Initially, Nashville’s Parthenon was considered, but by 1925, a stunning new classical memorial and auditorium stood across from the State Capitol. The story of the War Memorial Building’s origins is told with particular focus on those Tennesseans who served in France, then returned to ensure that their comrades and their military service would always be remembered. Remembering the World War I Doughboy: The History of Tennessee’s War Memorial will be on view until December 31, 2016. There is no admission charge to the exhibition or to the Military Branch Museum, which is open Tuesday through Saturday from 10 a.m. to 5 p.m.